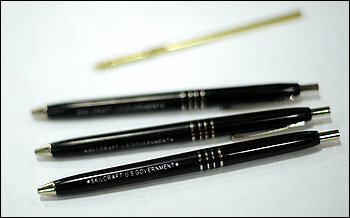 Some of you may have seen an article recently in The Washington Post about the old-fashioned Skilcraft US Government pen. I stumbled on the article by chance, but had recently seen one of these pens in person a few months ago. The style took me back to my childhood - my dad used torpedo-shaped clicker pens all the time. The now-ubiquitous Bic Clic Stick either hadn't come on the scene, or hadn't gained traction. These, and Bic Crystal stick pens, were the pens of my childhood. So, anyone who knows me, knows what happened next. I spent some time trying to find a way to buy them online. I found a place that sells them $8 for a dozen with free shipping (email me if you want to know where.) I bought a box. Here's another thing I found out: AbilityOne is a non-profit program run by the National Industries for the Blind (NIB) designed to employ people who are blind or near blind. AbilityOne makes a lot of stuff, they make it in America, and they make it for a reasonable sum (Bic Clic Stics are $7 a dozen at Office Depot.) I get to indulge my inner (outer? raging?) cheapskate AND my writing implement fetish AND my "do good with consumer power" inclination, all at the same time. And the pens writes pretty decently, too. I finally got new glasses after 7 years. One of my coworkers called them "hipster glasses." Now, I have almost never been described as hipster. In fact, I tend to run towards the downright unfashionable in most of my un-fashion choices. I am not so sure if I am okay with a hipster designation or not. What do you all think? Hipster or not? Dev and I took Elliot to family story time three weeks ago at the Kenton branch of the Multnomah County Library. We had good times with the 22 other families (!) in the room. As usual, before we left the library, I browsed through the shelves randomly in the adventure, fantasy and sic-fi section. I almost never find anything that begs me to check it out and read it. Doubly so in this day of digital catalog searching and reservation. Most of the time I find the second or fifth book in a cool looking series and never get around to trying to find the first book in the series. I saw the title on the spine and had to look. The gist is that the book follows the adventures of the plucky band of "bad" guys. They go on missions for Morthul the Charnel King, an ancient, evil and rotting undead king who wants, literally, to rule the known world. The morality of the protagonists is grayer than the traditional flannel suit. And they do some truly disgusting things often enough that anyone with a weak stomach shouldn't read the book. What author Ari Marmell does so well in this book is to write the characters to have believable motivations. Even the Charnel King seems sympathetic in the moments when he is not ruthlessly crushing his opposition - opposition, by the way, that comes almost entirely from outside his kingdom. His subjects seem to be mostly normal people living mostly normal lives not overly concerned with the morality (or lack thereof) of their king. Really what I loved about the book is that it reminds me of (confession time) all the hours I spent playing Dungeons and Dragons with my friends in high school and college. Ari is himself a gamer and his characters interact in the way that I remember all of the players interacting during the game. Their banter could be the recorded chatter of me and my friends sitting around the table on game night. Also, the characters in the book come up with crazy and creative solutions to the problems they must overcome in their missions. Solutions like using bedsheets to defeat an extremely dangerous enemy that can trash five of the "heroes" in a "fair" fight. My friends and I would come up with wild ideas for our heroes to try. Solutions neither provided for by the rules of the game, nor considered by the adventure guide of the current mission. Sometimes they worked and sometimes they didn't, but they were always fun to try. It took me a while to realize that this last element of the book charmed me so much. After I finished reading the 550 pages (which only took five days - five days where I was working), I considered getting a copy of Neverwinter Nights (a D&D video game) or a short-term indulgence from Devon for World of Warcraft. Then I realized that I wanted the imagination and storytelling part of the role-playing game; the part of the game where every scene from every movie runs through your head and a cinematic, wild, unlikely action pops in your head. Win or lose, everyone around the table holds their breath and the game has its own reality for just a split second. Point of fact, one of the longest running games I played in college was International Missions Force (IMF). A friend had cooked up the game rules based on a couple of other games. Really, the game barely HAD rules. We players were elite agents solving problems around the world. Maybe solving is the wrong word. In any case, those nights were collective bouts of storytelling fueled by junk food, caffeine, bad movies, good movies, and the cinema in our heads. I haven't started playing D&D again. I do miss the collective storytelling. 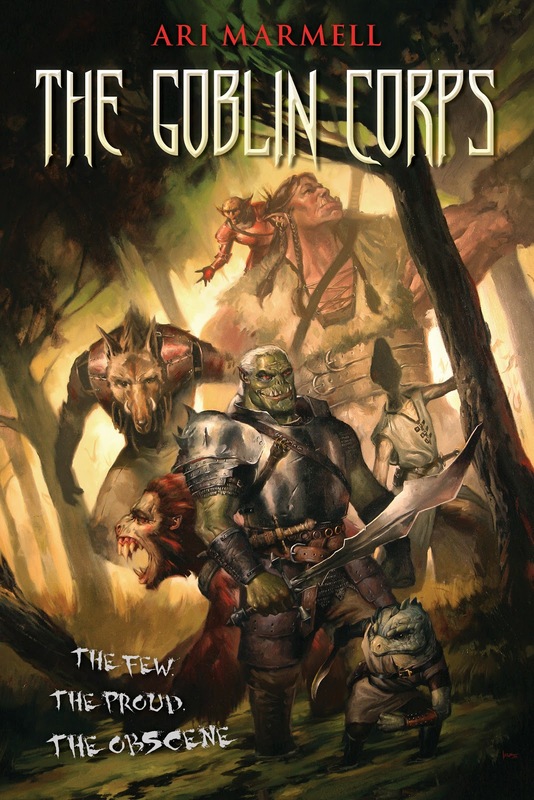 Anyway, if you like fantasy novels or if you played D&D, you should probably read The Goblin Corps. So I forgot that Mox and Boj had a vet appointment today when I sent Dev to work the car. As you can see, the lack of motorized transportation for the pooches formed no barrier to getting around. After about 2 minutes of "whaaaaat?" the pooches settled into their blankets for the ride. At least one patron of the vet was very amused when she heard how the dogs got there. So first groceries, then little miss Elliot, and now the dogs. This beat up trailer has proved it's usefulness over and again. So today was the first day in a really long time that I gave myself over to the impulse to do pretty much whatever I wanted. I considered going to see a movie, especially Django Unchained. The sunny spring weather meant that I could not just go and sit in a dark room for three hours, even if that darkened room was filled by the flickering light emanating from the genius of Quentin Tarantino (not that he's always brilliant - but that's an entirely different discussion). After I biked Elliot to daycare in the glorious spring sunshine, I puttered around the house a little bit. Patched some holes in the bathroom where the toilet paper holder used to live. Worked out for the first time in three weeks. Walked the dogs. Mundane stuff that shouldn't really merit mention in a blog, but I'm scene setting, right? 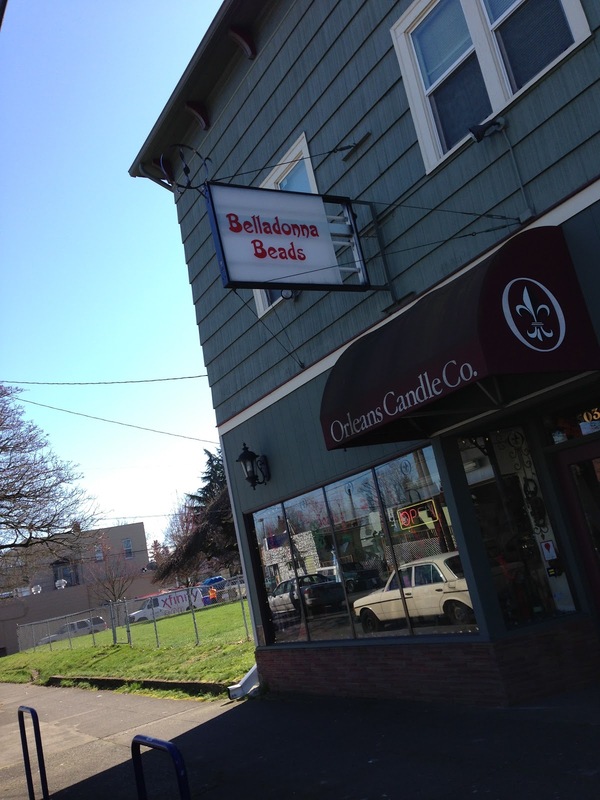 I warm up the motorcycle and roll down Lombard to Belladonna Beads. 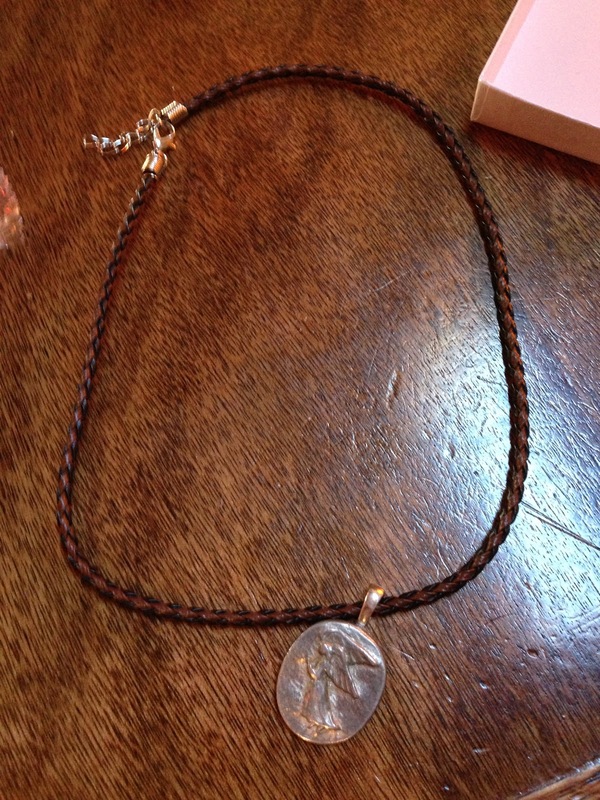 Dev's sister Tiffany gave all three of us St Christopher coins a few years back. I have carried mine around with me in whatever bag I am using at the time. Even though I am not particularly religious (and never was Catholic), I *have* always had a weird affinity for St Cristopher since he is the "patron saint of travelers" according to Father Mulcahy from M.A.S.H. Since I like pretty much any activity that involves traveling (hiking, climbing, motorcycling, bicycling, and on), St Christopher seems like a natural fit. In any case, the lovely folks at Belladonna beads helped me set the coin on a hanger so I can wear it as a pendant and not worry about losing it or not having it with me. and tucked in (as the Brits say). and I just sort of hung out on the roadside for a few minutes, listening to the wind and the silence. As many times as I have driven along 14, I have never once stopped at this viewpoint. I was pleasantly surprised by how much quiet I found there for the 10 minutes that I stayed. It was not unlike the quiet I find on hiking viewpoints when I stop moving and just stand and listen. The rose hips are definitely in there, but not in a disagreeable way. Good beer to end a good day. Question: How does someone spend an hour of their fall break from school in Portland, Oregon? I found the pattern an recipe online. The crooked mounting and off center reflective tape were my additions. Fresh corn on the con!!!! If you know me “in real life” then you will already know the following facts. I am a Registered Nurse (and wow, did that take a long time! ); I used to fix Macintosh computers for a living; I’m a raging, raving “pinko-commie” liberal; I live in Portland, Oregon and love it here in the Northwest. Oh, and I have the most fabulous daughter on the planet. My main off-work focus right now involves finding new adventures. For a while I was obsessed with motorcycles. Then I went to mountains with great ardor; rock climbing, mountain climbing, snowboarding. I'm feeling transitional now. I might start swimming again. Maybe backpacking more this summer. And I want to travel more.